This is a project I’ve done while doing the freeCodeCamp to get my FCC Front End Certificate. See the complete challenge specifics at FCC Random Quote Machine. Build a CodePen.io app that is functionally similar to this demo. Fulfill the user stories. Use whichever libraries or APIs you need. Give it your own personal style. I can click a button to show me a new random quote. I can press a button to tweet out a quote. This is the solution I’ve submitted using Bootstrap, jQuery, and Ajax on CodePen. 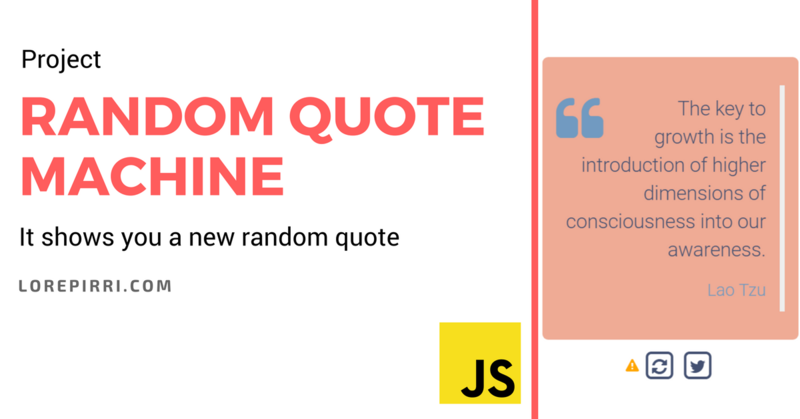 See the Pen Random Quote Machine by Lorenzo (@lorepirri) on CodePen. If this article was useful to you, please share it using your favorite way for doing it! If you have suggestions of improvement or you’ve found something wrong, please let me know!